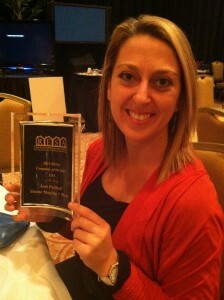 2012 RESA Staging Company of the Year, taking a closer look! If you only get your news from the TV, you will have missed that Jessica Pirone’s company of Just Perfect Home Staging + More was awarded the 2012 RESA Staging company of the Year! It’s not a surprise, since Jessica started out to build a company when she first headed into staging, unlike so many of us. Most of us just start staging as one person pursuing a passion for the craft. At some point along the way, we incorporate and struggle to get all the paperwork and accounting fitted in as we get busier. Friends love to help out and eventually, we have to hire a person on a regular basis…or maybe that’s just how my story when I started out back in 2002? Jessica’s back ground was an art and marketing degree, with parents who were both entrepreneurial. She always wanted her own company, but not a boutique like her mother, something that still involved color and design but…initially she wasn’t sure. It wasn’t until a friend suggested she’d have a flair for home staging, did she take the plunge, and when I tell you she never looked back, you would be amazed by what she has accomplished in such a short time! The company services homes for sale that range from starter homes in the $100,000’s to upscale homes on the beach. And, within this range, she has her pricing set so that she can employ a marketing person, a sales person, and a lead interior specialist! The Just Perfect team have routinely saved sellers money – $25,000 here, $64,000 there – and the speed with which their stuff sells takes your breath away. In this last year – 2011 – no home staged by Just Perfect was on the market longer than 90 days without a contract! (except for homes listed over a $1 million, which take longer most places.) Are they picky about which sellers they’ll take on? You betcha! And maybe that’s the lesson for all us. Just because we all love to stage doesn’t mean that we should always take every job that comes our way. Why beat our heads against a wall? There are different packages available depending on how many rooms… but the very minimum is doing everything you can see when you walk in. Why? Because that is what makes houses sell in their area. Occupied stagings are not offered without accessory packages, because without them, it is impossible to look as good, and doesn’t sell the property as well. This year, the company has not staged a property that has taken longer than 90 days to sell. Their clients sell their properties an average of 76% faster than their competition and for 6% higher offers. They are results oriented, and therefore, rarely take a client that refuses to listen to their agent on price. They work with agents that have the same goals and philosophies and are out there to sell properties, not just have a sign in the yard. By completely immersing themselves in the real estate industry and showing amazing results, they have built close relationships with real estate companies, real estate agents, investors, and builders. Don’t you want to spend a day with this 2012 RESA Staging Company Of The Year, and see this not just the fabulous designs, but this business-model in action? You can line up right behind me! !